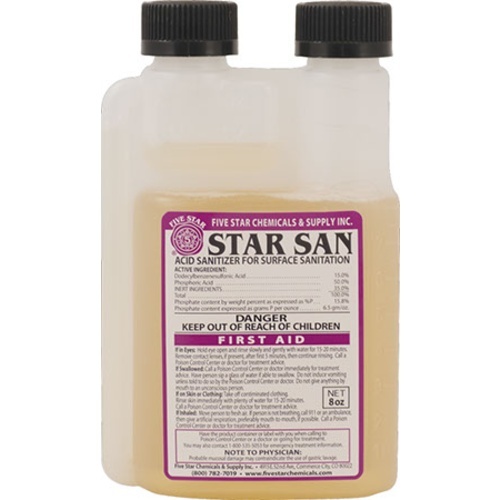 Star San is an acid-based sanitizer that is quick, odorless, tasteless and safe for most materials except softer metals. Use of 1 oz per 5 gallons of water and a contact time of 1 minute makes Star San very economical and convenient. Sanitation is one of the variables in brewing even the beginning brewer has complete control over. At the homebrew level, Star San is really your only option. Worry free and easy to use. If your not using this, stop brewing! This product works really well. I will continue to use it. Way cheaper than other places. Absolutely necessary to have this on hand in the brewery. A little lasts a long time, nice to have a some peace of mind at such a relative low price. This is the right product for the job. I keep a sealed 5 gallon bucket of it mixed up at all times, change it out when necessary. I've never measured for bacteria or wild yeast and have never gotten sick. I use this product always and everywhere to ensure sanitary brew and bottling. I've even used it to sanitize canning jars, and have similar good success. This is my preferred size to get, because it last a long time, but not so long that it loses effectiveness or the screw caps get weakened by time. Of course we want to write a review, because the stuff works and my beer tastes..
Tastes great, never had a problem yet, not sure how it sanitizes and does not hurt the Beer, but it does and works well. Don't be tricked by a bunch of foam, it will condense to liquid you may not want in your Brewing equation, but besides that works great! Never a concern with sanitation when using StarSan. The measurement reservoir at the top works well to deliver an accurate dose. When using at full recommended strength I wear vinyl gloves, as recommended. Works to sanitize everything in seconds! Definately wear gloves when working with it though. It will dry out your hands real quick. Star San makes sanitizing easy. Make 2.5/5 gallons for a brewday in an unused brew bucket and fill up some spray bottles. I never have infections or issues. Don't fear the foam. Foam is good. i use this on everything. bubbles are taste-free so they don't affect flavors. you have to sanitize with something, and this is the best out there. Hands down, the best sanitizer on the market. I like to mix in a spray bottle to get those hard to reach places. I use this for everything brew and yeast related. I only wish Morebeer would offer the larger formats. Get the big bottle  it doesn't get any easier than this. I use this product in the keg and carboy washer but you have to be careful about excessive foaming. Be sure you put it in a large tub, bathtub, or sink. I buy a large 32 oz bottle and use it to refill small bottle with which to measure out from when making solution. Great stuff. Have been using in my B3 1550 since 2004. Never had an issue with my system. Recommend this product. The StarSan is always easy to use and helps to keep the equipment clean. I use this for my fermenters, bottles, kegs, lines, bottle caps, you name it! I keep a spray bottle of this mixed with water for ease of use on surfaces. What can I say? This is The best thing in the brew house. It sanitizes in about 30 seconds, is neutralized instantly at the pH of beer, and the yeast are delighted to eat the phosphorus content. It is tasteless & odorless. It has become the most important item I use. Great stuff! Seriously, if you haven't tried this product yet, what are you doing? This is the easiest sanitizer out there. No rinse!!! i talked to the guys from 5 Star and they told me that foam contact is same as liquid contact. Chemicals like this are probably directly responsible for making homebrew better over the years. Fantastic stuff. The dilution of .67ml / 1 L water. Your bottle will last an eternity if you use that. I use distilled water and mix it into a sprayer. Lasts quite a long time if you use distilled. I found if you mix it with tap water that it gets cloudy really fast. I don't have ph test strips to see if it still works, but I don't trust it beyond a single session when its cloudy. Works well to get painted bottles clear. I had a few Stone bottles that a few days in star san fixed right up. One bottle goes a long way. Don't over tighten the cap or it will crack. This stuff is great! An 8oz bottle will get me through about 100gal of brewing when mixed with distilled water and topped off in a 5 gallon bucket. Lasts a very long time and easy to use! I usually make about 2.5 gallons at a time but I am sure you could use less to make it stretch if your on a budget. To keep your stuff from getting funk nasty. Simply amazing product! Excellent sanitizer. My go-to sanitizer for all things brewing. Buying the bigger sizes is a bit more economical. As has been noted many times, this is a great brewing sanitizer. This is the sanitizer I use for all my extract brewing. I find it easy to use and effective. I sanitize all my equipment and bottles wiht starsan (except for a few metal bits that get boiled on brewday). So much easier than sanitizing with iodine or bleach. The big size is more economical and ensures you have plenty around. This is the go to sanitizer. So easy to use. Let the foam do it's job and don't rinse. Don't worry about getting this into your wort or even fully fermented beer, it is 100% safe and becomes yeast food. not a big fan of iodine mostly because of the color and the great fear from when i was a kid and my grandfather putting it on cuts. starsan works great from what i can tell. i've never had any issues with it. i've made 5 gallon buckets and held on to them up to 2 months. i normally make a batch every time i brew and store it until i bottle. when using starsan it can produce a lot of foam, BUT DONT FEAR THE FOAM. just ignore it like it was never there. Lasts for a long time too. It's amazing how cheap this stuff is over the long-haul. You use a tiny amount if it to mix up a sanitizing solution to keep nasties out of your brew. Works great in a spray bottle for those unplanned sanitizing needs. Love this stuff, I've never had an infected batch. The residual bubbles are harmless so don't worry about them tainting your beer. Small Star San bottle is just right for operating the squeeze/measure. Of course, I also order the big size bottle for refilling the small. So easy to use. The foam gives the security that everything is contacted. been using this product since day one. easy to use, no aftertaste. this product does what it intends to with sanitation. have only had 3 infected batches of over 100 brewed.